Redshirt sophomore forward Sarah Overcash loses control of the ball during Saturday's game against George Mason. Updated: Jan. 21, 2019 at 11:19 a.m. 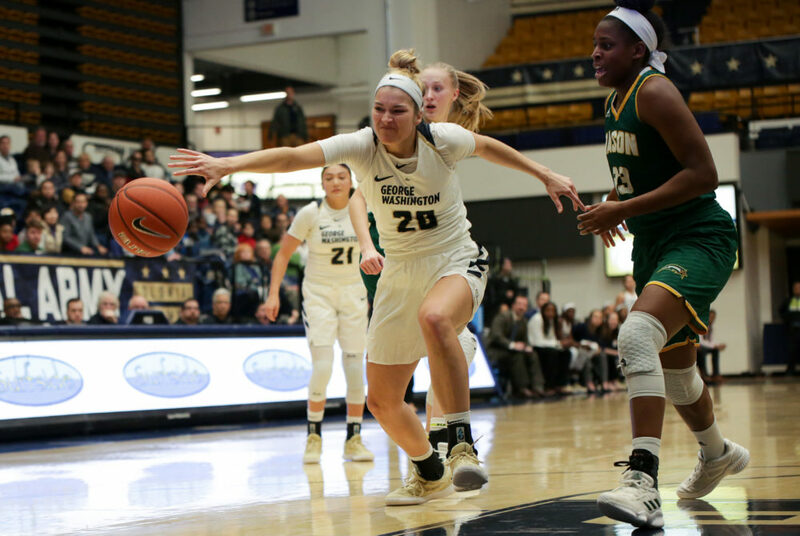 Prior to Saturday afternoon’s contest against George Mason, women’s basketball had won 13 consecutive games against its rival from nearby Fairfax, Va. But a lackluster third quarter and poor free throw shooting doomed the Colonials (6–12, 3–2 A-10) in a 64–60 loss to the Patriots (10–8, 2–3 A-10). The victory was George Mason’s first at the Smith Center since 2002 and the team’s first overall against GW since Dec. 22, 2011. During a game in which both teams traded runs, the most pivotal run belonged to George Mason, who erased a seven-point halftime deficit with a third quarter stretch outscoring the Colonials 18–6. From that point, the team never looked back. Sophomore forward Neila Luma tied her season-high with 22 points – the fourth time she has surpassed 20 points in a game – on 9-for-19 shooting with two steals and a block. But the Macungie, Penn. native was 4-for-10 from the free throw line and grabbed just two rebounds on the night, her lowest total since Dec. 29 against William and Mary. Sophomore forward Neila Luma went just 4-for-10 from the free throw line and grabbed two rebounds on the night. Senior guard Mei-Lyn Bautista also had one of her finest performances of the season in the losing effort, finishing with 10 points, seven assists, six rebounds, three steals and two blocks. All of her points came from behind the three-point line. The introduction of freshman guard Maddie Loder, who had 14 points, six rebounds and three assists of her own, into the starting lineup has allowed Bautista to play off the ball more. George Mason sophomore guard Nicole Cardano-Hillary, who entered the contest as the Atlantic 10’s leading scorer at 20.4 points per game, was held to 13 points, seven rebounds and six assists on 4-for-14 shooting from the field. Loder, Luma and Bautista all drew defensive assignments against the 5-foot-7-inch point guard from Madrid, who ranks 19th nationally in points per game. But while Cardano-Hillary was not scoring at her usual clip, junior forward Jacy Bolton was doing the damage for the Patriots. Bolton had a double-double with 17 points and 14 rebounds. Fourteen of her 17 points came in the second half and her post presence helped to bolster a significant 49–27 advantage on the glass for George Mason. The Patriots converted 16 offensive rebounds into a 12–1 advantage in second-chance points and a 28–12 advantage in the paint. After being outrebounded by a 10–2 margin in the opening five minutes, the Colonials found themselves trailing 9–6 with 4:21 left to play. But sophomore guard Lexus Levy came in off the bench and scored five points to propel the Colonials to a 14–12 advantage at the end of the opening frame. GW limited the Patriots to 5-for-17 shooting in the quarter. GW stayed red-hot to open the second quarter. Across the first and second periods, the Colonials went on a 14–0 run and opened up a 23–12 lead, their largest of the game, with 7:46 remaining in the second quarter. Given the opportunity to extend their lead, the Colonials fell victim to uncharacteristically poor defense, letting George Mason come back into the game with a 12–3 run. The Colonials still had a 33–26 edge at the half off of 44.8 percent shooting. Loder and Luma each had eight points to their name at the break. “Instead of having the focus early and the toughness early to make it a double-digit lead going into the half, we weren’t focused on our defensive assignments,” Rizzotti said. Patriots junior guard Sarah Kaminski scored all 14 of her points in the first half, accounting for nearly half of George Mason’s total offensive output on three-point shots. But the Patriots changed the game with their ability to score in the paint in the second half. The third quarter was scrappy and neither team was able to generate momentum until just past the halfway mark in the frame. Bolton knocked down a three from the top of the key to put the visitors ahead 38–37 with 2:20 remaining in the third period – the Patriots’ first lead since the first quarter. During that quarter, the Colonials fell victim to 2-for-11 shooting and were outscored 10–0 in the paint. Trailing 44–39 entering the final frame, the Colonials needed to find their offensive footing. While they were able to do so with 21 fourth-quarter points, they struggled to get stops on defense and could not capitalize on their free throws. Luma, who came into the game shooting 59.0 percent from the charity stripe, went 4-for-8 from the line in the period, including two misses with the Colonials facing a 52–51 deficit. 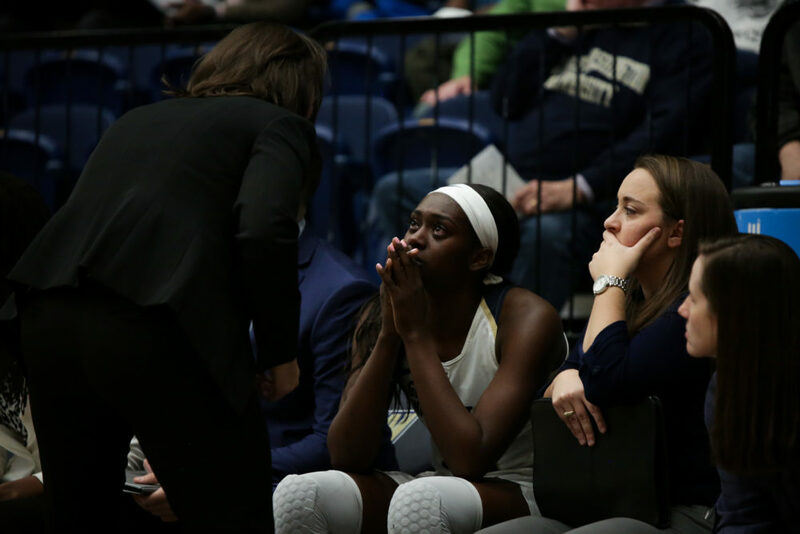 The Colonials squandered multiple trips down the court facing the one-point deficit, and with just two minutes remaining in the contest, George Mason embarked on a 5–0 run, the final knockout punch. The Colonials will stay at home Wednesday to host VCU at 7 p.m. The Hatchet incorrectly reported that Sarah Overcash is a redshirt junior. She is a redshirt sophomore. We regret this error.